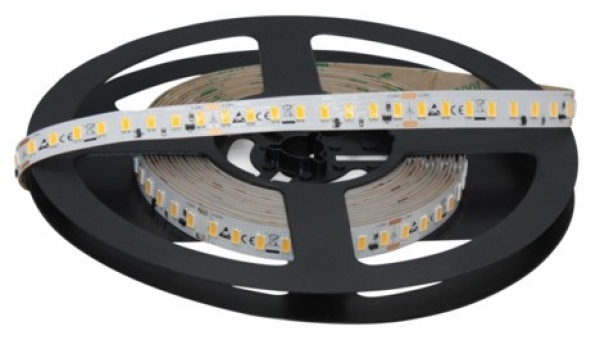 PROF LED strip with very high efficiency (up to 140lm/ W) and constant current (constant voltage mode) LED Strip highest quality. Advantages of this strip is the temperature monitoring for each segment, the extended voltage range of 21-30V DC (no voltage drop). Highest light output, as well as flexibility. For operation you need a 24V DC power supply. The strips are dimmable with our 24V controls. For fast simple assembly, back with heat resistant 3M tape. Connections for soldering on all interfaces. Shareable all 6.25cm with scissors. Mount the strips for cooling and in favor of life always on an aluminum profile or the same. Otherwise, the warranty expires. We recommend our LED profiles for ideal cooling. Note the mounting instructions. Order easily your desired length through the shop. Desired Mass missing? Please contact us. 36-month warranty. Deposit of BIN codes on every order.